Egyptian MPs approved in a plenary session on Sunday the appointment of Kamel El-Wazir, the former head of the army's Engineering Authority, as the new minister of transport. "The appointment came hours after former transport minister Hesham Arafat resigned following a tragic Cairo train crash on 27 February, leaving 22 dead and dozens injured," said parliament Speaker Abdel-Aal, adding that "the appointment goes in line with the constitution and parliament's internal bylaws, which state that the president is authorised to make cabinet reshuffles or name new cabinet ministers, only after consultation with the government and approval by parliament." Abdel-Aal said that President Abdel-Fattah El-Sisi sent a letter to parliament which "included a CV stating that El-Wazir is a distinguished military officer who led the army's Engineering Authority and took charge of implementing many national mega projects." "El-Wazir is well-known to all Egyptians as a man of high performance, not to mention that he received many medals in appreciation for the great roles he played in implementing national projects," said Abdel-Aal. 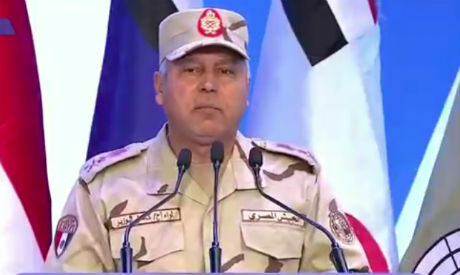 In a cultural symposium held on Sunday by Egypt's Armed Forces on the occasion of Martyrs' Day, President El-Sisi revealed that El-Wazir was nominated for the post of Egypt's new transport minister. El-Sisi also decided that El-Wazir would be promoted from major general to lieutenant general. "I vow that you will see a different Railway Authority on 30 June 2020, and I vow that I will give all the support necessary for major general El-Wazir to make of this utility a success story," said El-Sisi, adding that "there is no problem with El-Wazir seeking the help of as many army officers as he likes to impose discipline in this utility." For his part, El-Wazir vowed that he will improve the performance of all the sectors affiliated with the Ministry of Transport. "We will prove that we are patriotic Egyptians seeking to improve our country," said El-Wazir. El-Wazir graduated from the technical military academy in 1980, and received "a Master's degree in military sciences, and became a colleague at the Nasser's Military Academy," said Abdel-Aal, adding that "throughout his career, Al-Wazir has been a good example of devotion, discipline and efficiency, not to mention that many giant national projects bear the hallmark of his performance."